Handmade gemstone bracelets in several shades of brown with sterling silver (925) details. The beads are made of brown agate with beautiul prints. More information about gemstones. Do you have specific questions email them to our graduate gemologist Laetitia. Handmade gemstone bracelet of snakeskin agate and multi colors moonstone. Beautiful bracelet made of natural gemstones snakeskin agate and moonstone. 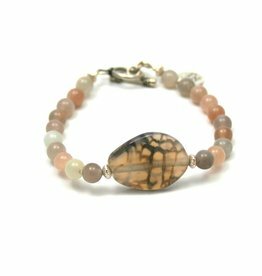 Rare ocean jasper beaded bracelet in beautiful brown colours with agates. Handmade bracelet of brown/orange agate and sterling silver elements. Handmade brown agate bracelet with sterling silver (925) details.